Blade length :　67.1　cm or 26.42inches. Width at the hamachi : 2.9 cm or 1.142 inches. Width at the Kissaki : 2.0 cm or 0.79 inches. Kasane : 0.58 cm or 0.23 inches. and longer kissaki which looks like Nanbokucyo style. Shinogiji: item had and mokume had mixed with masanagare and some oohed. temper line. In the Hamon, there are many sunagasi and kinsuji work. Special feature: The Uda school is said to have originated in Yamato province. that was very good at making use of well-tempered iron’s special qualities. Especially conspisious chikei appeals us strongly. Tsuba: Round shape iron Tsuba, some design is engraved with open work. Menuki: Shakudo, Samurai is engraved with gold color. Fuchikashira: Shakudo, Samurai is engraved with gold color. Kogai: Copper, Kiri Mon are engraved. 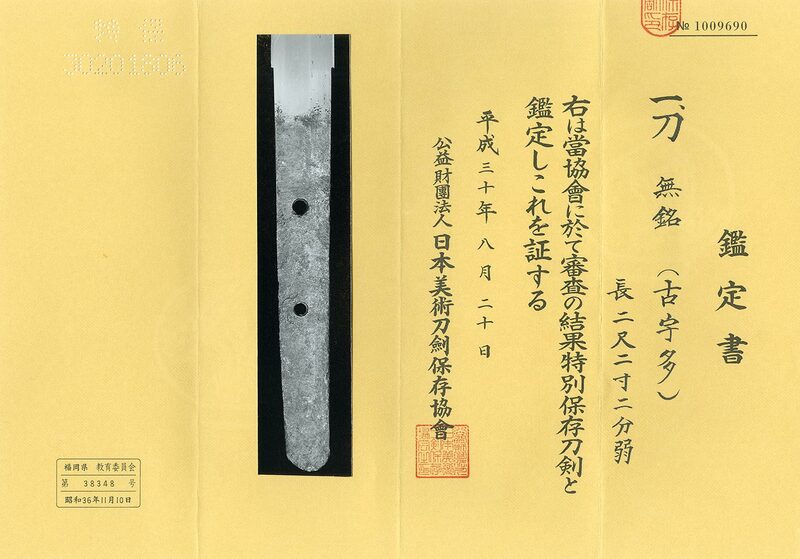 From Aoi Art:THis sword was judged as Kouda with Tokubetsu Hozon Token. of the blade. Especially from middle to Kissaki hamon is typical Kouda school hamon. Back ground of age: At Nanbokucho perind, Nancho power becomes decline.